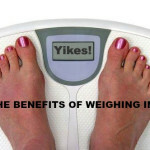 Do you leave your meal choices to what’s available on the road, at the airport or in your vending machines at work? Because Eric and I are in the middle of moving to a new home, my grocery shopping has been erratic lately. I keep thinking… why buy food if I only have to move it soon. So it’s hard to plan a day’s meals let alone plan to bring something with me. 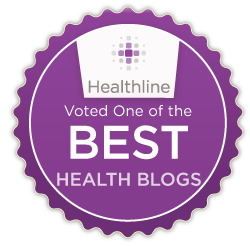 But when I consider the alternatives… um, like 7 Eleven, fast food and vending machines, a wee bit of pre-planning definitely saves me time, money and even a few pounds. 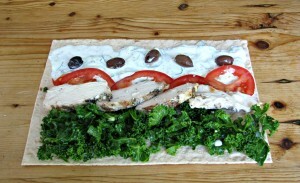 That’s why I love this Greek Style Chicken Wrap. I travel a frequently on business and have found the trick to healthy eating on the road is to pack, utensil-free, mess-free meals. This wrap and roll meal idea isn’t new but the ingredient options are ENDLESS and you don’t–I repeat DON’T–have to use high fat cream cheese (to keep it together). That’s just gross in my book. Here’s the key ingredient: Whole Wheat Lavash. 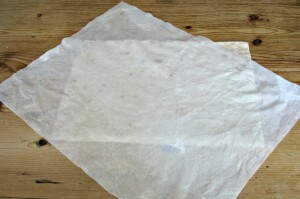 It dries out really quick so make sure you cover it with a wet paper towel if you are making multiple rolls. You can find lavash style bread at most markets but I found the “whole wheat” version at Trader Joe’s and Sprouts. 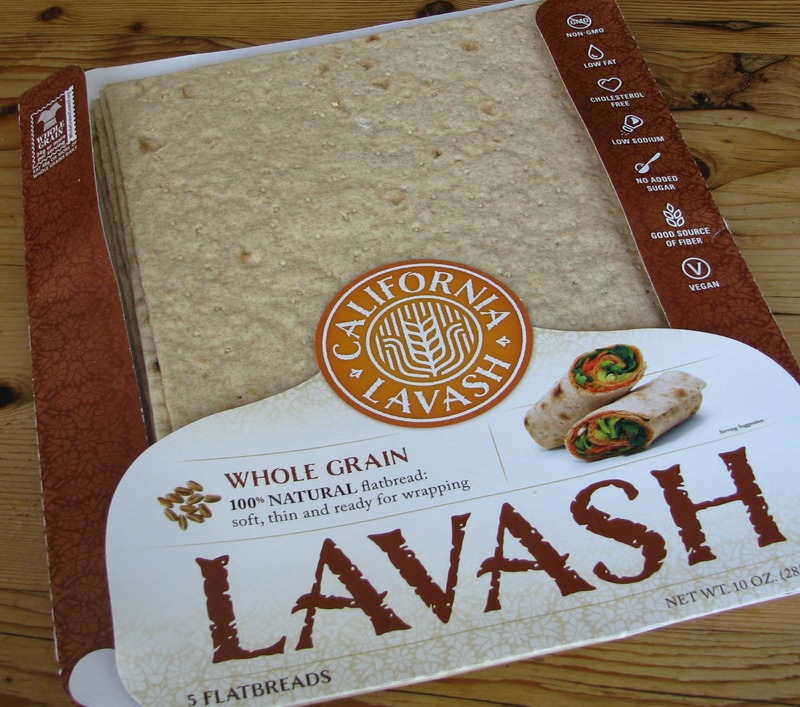 Lavash is easy to roll up and easy to pack. And a bit healthier than most whole wheat tortillas. And today I’m also using kale. I love kale because it doesn’t get limp like lettuce does and can withstand a long day in the airport. Then there’s the dressing. 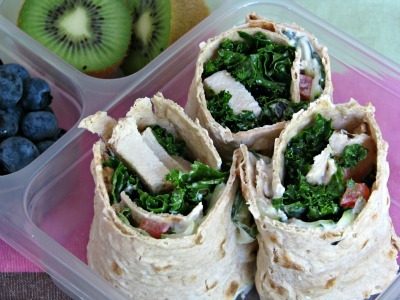 Don’t be afraid to use pre-made dressings or dips and sauces on your wrap. 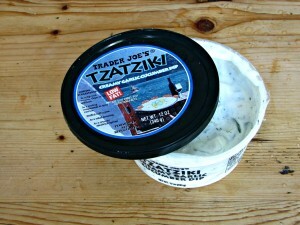 I love a Greek Tzatziki sauce I buy at Trader Joe’s but you can use mustard, hummus, nut butters or salad dressing, too. When you assemble it, it will look something like this. Rub the teaspoon of oil in your hands and massage into the kale leaves to soften. Set aside. To assemble, remove the lavash bread from the package. Warning! It dries out fast so cover it with a wet paper towel as you get your other ingredients ready. Now spread the ingredients length-wise on the wrap. No particular order except place in long rows next to each other. And leave the dressing last as this will help it stay together. Roll it up from the bottom and cut into manageable pieces. 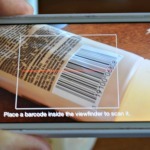 Wrap quickly in plastic wrap or place in an airtight container for easy traveling.